When you or a loved one become confined to a wheelchair or scooter, suddenly things you once took for granted seem very out of reach. Simple things, like getting to different rooms of your own home, can look nearly impossible. Our range of Long Island wheelchair lifts and wheel chair ramps are designed specifically to give back your mobility and freedom; keeping your home fully accessible to you. The Harmar Highlander Vertical Lift series is an excellent choice for indoor or outdoor use. 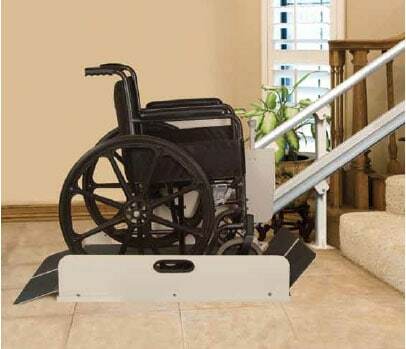 The lift can be installed next to a porch or stairway, so that the passenger enters the chair lift and the lift itself rises to the top of the platform. Designed with an eye for both safety and precision, the ramp is fitted with a non skid surface and is weather and wear resistant. The RPL model can be fitted for heights up to 6 feet, which accommodates most residential structures. The CPL series can be fitted for heights up to 14 feet. Both models are built with maximum efficiency in mind, require little maintenance and are excellent for both indoor and outdoor use. These models may be a good alternative when the incline of the stairway or other architectural features make installing a ramp too difficult to maneuver. The Passport by EZ Access vertical platform lift is a solid option for both indoor and outdoor use. This model features all-aluminum construction, making it both light and very strong. In fact, it is widely known to be the lightest residential platform lift on the market, weighing in at less than 400 pounds. The Passport Vertical Platform Lift comes with an individually prewired platform lift tower, along with a gate for an easy and safe installation. 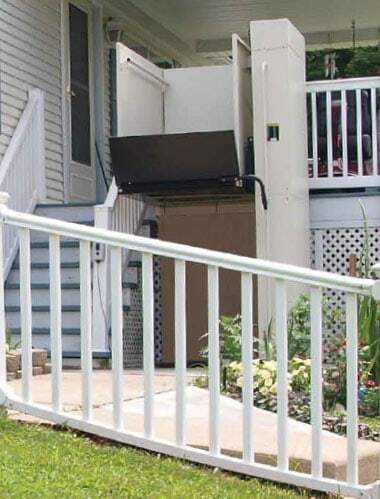 This wheelchair lift is usually utilized by individuals whose mobility is limited, and is a perfect solution for uneven or difficult porches and pathways. The Harmar IL500 Sierra Incline platform lift is an excellent option for indoor use. This model does not require wall modification, instead using step brackets which make installation easier and far more cost effective. This chair lift will hold up to 500 pounds, offers automatic folding ramps for easy entry and exit, and has a maximum lift of 40 feet. A great alternative when a vertical lift doesn’t fit the architecture and space. This chair lift offers full mobility for a wide range of chairs and scooters. All of our products are designed for easy installation, with the best quality. Each home is slightly different. We’ve worked hard to find the best products to fit every type of architecture and need, allowing our clients full access to all of the rooms in their home with minimal inconvenience. Our goal is to provide the safest, most affordable handicap lifts, without taking away from the design of your home. The end result is that you have full access to every floor of your home and full mobility, without sacrificing the design and appeal that you enjoy.